From Donald Stilwell's sense of loyalty toward his country and fellow man, to the love he feels for his family, it's obvious the words obligation and commitment mean something deep inside his soul. I am proud to present you with a book you may, or may not, have heard about - written by a man you may know as your best friend or a man whose name you've never heard. However, if it should be that you are reading this and know Donald Stilwell personally, I would love to hear your thoughts about Stilwell and his book, Obligation. 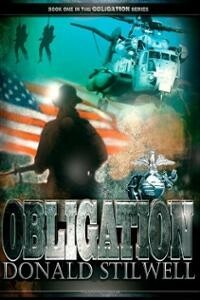 Obligation is a story about extremes and ideals. As a boy, Kevin went through an extremely dark set of circumstances, losing his father to war, his brother to an accident and his mother because she couldn't, mentally, cope with such levels of despair. The brightest spot of Kevin's young life came when he went to live with his paternal grandfather - a man who loved him unconditionally, teaching him everything he knew. Peter would become the next person to cast light into Kevin's soul; they were as brothers who never fought. However, after his grandfather's passing, Kevin became immersed in a world of darkness, sanctioned by his government. Intending to become a Marine, life didn't turn out as Kevin expected. Being the ideal candidate, he was placed into a special program - a field which destroyed his soul, day by day, ultimately, burning him out. In spite of the darkness lingering in Kevin's soul after breaking free from what he felt was a life of crime, he couldn't have imagined his darkest moment was yet to come - a moment in which every painful memory and heartache from the past would pale in comparison. Ultimately, Obligation is a story which reinforces the precept that, despite the darkness of the past, light can still shine upon, and within, the human soul. There is always a reason to hope for a better tomorrow even as we fight our inner demons. I can't twist your arm, forcing you to read Obligation by Donald Stilwell but, should you decide you would like to read more about it, please click the book cover above. It will take you directly to ht ebook's page on Amazon. Want to read the author interview I had with Donald Stilwell? Check it out right here.